There's a new scifi novel called Ready Player One that's been getting a lot of buzz. On the surface, it seems kind of clichéd - it's set in a dystopian future where everyone lives in an online computer-generated reality called OASIS, yada, yada, yada. The twist is the story about a massive treasure hunt being conducted in OASIS to find its creator's vast fortune, where players must follow clues based on the creator's childhood. The novel centers on one disaffected player who stumbles across a major clue, and becomes the target of various groups trying to find the treasure. The novel is a tribute to videogames and 1980's pop culture, often described as Willy Wonka meets The Matrix. As a child of the eighties, this novel really strikes a chord, but it's also really fun. I'm not alone. 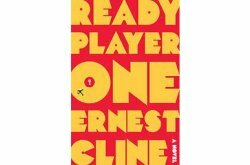 One editor at Boing Boing called Ready Player One the best science fiction novel he'd read in a decade. I admit, I haven't read the whole thing yet, but I've done more than I usually do - I've read the first three chapters. Boing Boing has posted a PDF of the first three chapters, so you can check it out for yourself. I will have to do so. This sounds like an interesting read.